After a long hiatus, I’ve decided to give blogging a second chance. It’s been three years since I last posted an entry and for me this is a fresh start. I used to blog on another site which I have now completely deleted due to various reasons. After a period of turbulence, angst, drama and what have you’s I finally decided to let go of most of the writing I did during that stormy period in my life. Those I wish to return to, I keep in a private journal. Those pieces I think should be kept will find a second home here. Kate was the childhood name my father gave me. It’s the name that my cousins and friends from childhood know me by. Kate is the girl I left behind and found again. I look at this picture where I am almost eight. 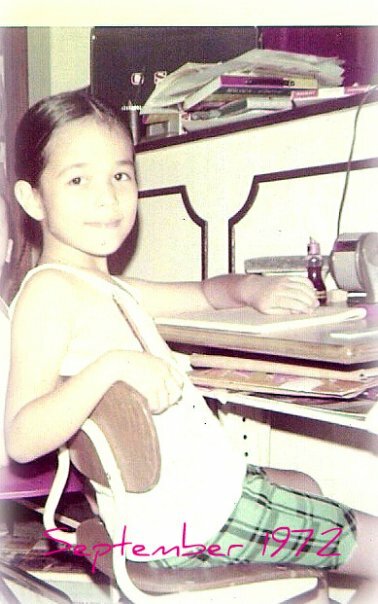 Dad took it one afternoon that week where we had no school after Martial Law was declared. The photograph is now almost 40 years old. I received this writing desk the Christmas before. I remember seeing it at the Matsuzakaya store in Cubao where my dad used to take me every week-end and he saw that I had fallen in love with it the moment I saw it. To this day, I can still remember it looming large beside our tree on Christmas day. My heart bursting with joy as I tore off the wrapper that revealed my brand new Made in Japan writing desk and chair. The desk served me well for many years. Writing has always been my refuge, my ally, my way out of the darkness. “Paper can hold everything…” I’m not sure now if it was Isabel Allende who wrote that but in my own life I have found that to be very true. As a child, paper held everything for me — my joy, my sorrow, my laughter and my tears. Today there is the digital space that acts as a repository for memory where one is able to reach a much wider audience. And yet, I still keep some of my memories written in long-hand on good old paper. Those are the ones I shall keep to myself and perhaps to a select number of loved ones when I am long gone. else’s sky! Your wisdom can make a difference for someone who may be facing quite an ordeal in life or simply not having a great day, & then reading something like this makes all the difference in the world!